"Resistance functions for two unequal spheres in linear flow at low Reynolds number with the Navier slip boundary condition"
J. Comput. Theor. Nanosci. (2008) 5(10), pp. 2004-2021 (DOI:10.1166/jctn.2008.1007). "Disintegration mechanisms of charged aqueous nanodroplets studied by simulations and analytical models"
"Faxen-like relations for a non-uniform suspension"
AIP-generated PDF and gziped PS. Copyright (2004) American Institute of Physics.
" Improvement of the Stokesian Dynamics method for systems with finite number of particles "
" Many-body effects and matrix-inversion in low-Reynolds-number hydrodynamics "
Copyright (2001) American Institute of Physics. author-prepared gziped PS file with figures (69k bytes).
" Analysis of statistical quantities in simulation of fluidized beds "
APS-generated PDF file (240k bytes). gziped PS file WITH figures (113k bytes). gziped PS file without figures (45k bytes). DVI file without figures (44k bytes). (previous version) " Behavior of fluidized beds similar to equilibrium states"
DVI file without figures (55k bytes). gziped PS file without figures (57k bytes). gziped PS file WITH figures (123k bytes).
" Dynamical simulation of fluidized beds: Hydrodynamically interacting granular particles "
APS-generated PDF file (2,256k bytes). gziped PS file with figures (512k bytes). DVI file without figures (78k bytes). Int. J. Quantum Chem. (2009) 109(8) pp.1666-1671 (DOI: 10.1002/qua.22160). Multiphase Sci. Tech. 18 (2006) pp.135-154 (DOI: 10.1615/MultScienTechn.v18.i2.20). J. Fluid Mech. 554 (2006) pp.125-146 (DOI: 10.1017/S0022112006009402). J. Comp. Phys. 212 (2006) 247-267 (DOI:10.1016/j.jcp.2005.07.003). 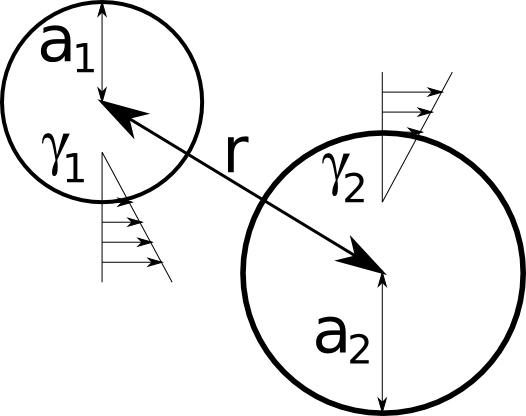 "The viscous stress in a non-homogeneous suspension"
first version (March 6, 2004); "Closure procedure of viscous stress for a non-uniform suspension"
Prog.Theor.Phys.Suppl No. 138 (2000) pp. 736-737.
" Fast Calculation of Hydrodynamic Interaction among Particles in the Stokes Flows "
" Particle-Scale Dynamics of Fluidized Beds "
Ph.D Thesis, Tohoku University (1997) (PS with figs 470kb, DVI without figs 82kb) in Japanese. abstract: The Science Reports of the Tohoku University. Ser. 8, Physics and astronomy, (1997) Vol. 18 (No. 1) pp.167-168 (local copy). "Hydrodynamic effects of density waves in granular flows "
DVI file without figures (22k bytes). gziped PS file with figures (369k bytes).
" Dynamics of many-body systems dispersed in a visous fluid "
Master Thesis, Tohoku University (1994) in Japanese. Bussei Kenkyu (Kyoto) 62 (1994), pp.732-792. Phys. Rev. E 51,(1995) R3815-R3819.
" Statistical theory of disordered suspension "
APS-generated PDF file (704k bytes). gziped PS file with figures (46k bytes). DVI file without figures (30k bytes).
" Simulation of granular particles in flow by the Stokesian dynamics method "
" Dynamics of particles and DNAs in micro/nanofluidic flows "
" Fragmentation Mechanism of Charged Nanodroplets - A Molecular Dynamics Study "
poster PDF (A0, A4) written on 3/23/2006. abstract (PDF 36kb) written on 8/12/2005. abstract (PS 32kb, PDF 18kb) written on 8/6/2004.
" Particles in a Fluid "
" Closure relations of non-uniform suspensions "
abstract (PS 56kb, PDF 40kb) witten on 8/28/2003. full paper (PS 118kb, PDF 190kb) witten on 3/19/2004. "Effective thoery of non-uniform dispersions"
" Non-Uniform Suspensions: Statistical Method and Constitutive Relation "
abstract (PS 38kb) written on 8/1/2003. slides (PS 68kb, PDF 178kb, slides) written on Nov. 22 2003.
" Statistical theory of non-uniform suspensions "
" Stokesian Dynamics method "
abstract (PS 28kb) written on 8/2/2002. OHP (PS 56kb, PDF 68kb, slides) written on Nov. 22 2002.
" Hydrodynamic interaction among particles in Stokes flow "
" Acoustic Lichtenberg Figures & the visualization of their dynamics "
abstract (PS 32kb) written on 8/2/2001. OHP (PS 72kb, PDF 186kb, slides) written on Nov. 26 2001.
" Microhydrodynamics of colloidal suspensions -- Stokesian Dynamics: The Next Generation -- "
for the series of " introduction of numerical methods for researchers on condensed-matter physics "
for Spring Conference of JPS (March 27 - 30, 2001) at Chuo Univ. abstract (HTML, PS 26kb) written on Jan. 26, 2001 in Japanese.
" Stokesian Dynamics: The Next Generation "
for Doi Project seminar (Feb. 22, 2001) at Nagoya Univ.
" Fast and Accurate Numerical Scheme for Particles in Low-Reynolds-Number Flows "
Summary (PS 38kb) written on 7/12/2000. abstract (PS 19kb) written on 7/31/2000.
" Fast and accurate numerical scheme for particles in Stokes flow "
for Mathematical Aspects of Complex Fluids (II)(Oct. 25 - 27, 2000) at RIMS, Kyoto Univ. proceedings (PS 120kb) written on 11/28/2000.
" Fast and Accurate Numerical Scheme for Particles in Stokes Flows "
for 32nd Fluid Dynamics Conference (10/2-10/3, 2000) at Kyushu Univ. proceedings (PS 52kb) written on 8/21/2000. "Lubrication-correction among particles in Stokes flows "
for Autumn Conference of JPS (Sep. 22 - 25, 2000) at Niigata Univ. abstract (PS 33kb) written on 7/25/200 in Japanese.
" Improvements on accuracy and speed of Stokesian Dynamics method "
for Annual Meeting of Japan Society of Fluid Mechanics (July 25 - July 27, 2000) at Kyoto Univ. abstract (PS 47kb) written on 6/7/2000 in Japanese.
" Fast calculating method for hydrodynamic interaction among particles "
for 1999 Annual report for Supercomputer center at ISSP, Tokyo University. for Doi-Project Symposium (June 1 and 2, 2000) at Nagoya Univ. abstract (PS 32kb) written on 5/9/2000.
" Improvements on speed and accuracy of Stokesian Dynamics method "
abstract (PS 22kb) written on 1/24/2000 in Japanese.
" Many-body effects of matrix-inversion in low-Reynolds-number hydrodynamics "
abstract (PS 29kb) written on 1/24/2000 in Japanese. poster (PS 116kb) written on 3/13/2000. proceedings (PS 80kb) written on 5/9/2000. abstract (PS 12kb, DVI 2kb) submitted on 8/5/1999. proceedingsPS(32kb); Prog.Theor.Phys.Suppl No. 138 (2000) pp. 736-737.
" Particle-Scale Dynamics of Fluidized Beds - analogy to equilibrium states - "
for International Workshop on Amphiphilic Systems (Aug. 4 - 9, 1997) at YITP, Kyoto University. proceedings (PS 46kb) in Japanese. Bussei Kenkyu (Kyoto) 70 (1998), p.36.
" Numerical Simulations of Hydrodynamically Interacting Granular Particles "
at the 1st Tohwa Univ. International Meeting (Nov. 9, 1995). Bussei Kenkyu (Kyoto) 66 (1996), pp.566-567.
" Miscoscopic Model of Granular Materials - Particles with Long-Range Interaction "
for Planetary Science Frontier Seminor (July 18, 1995). lecture note (PS 490kb) in Japanese.
" Hydrodynamic Effect on Granular Flows in Narrow Pipe "
for Conference at YITP, Kyoto University (July 11, 1995). proceedings (PS 0.5Mb) in Japanese. Bussei Kenkyu (Kyoto) 65 (1996), p.686. Int. J. Mod. Phys. B 7 (1993), pp.1899-1911.